Looking for an entree to serve at your Thanksgiving holiday dinner that will work for everyone? 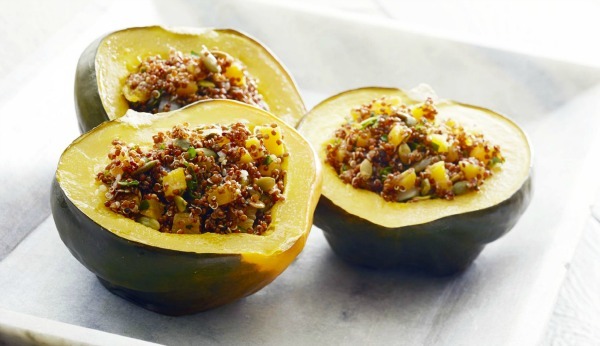 The Amaranth Stuffed Acorn Squash from Super Seeds is not only delicious and packed with seasonal flavors, but it also fits the Welcoming Kitchen model -- it's vegan, gluten-free and free of the top 8 allergens. 2. Cut squash in half lengthwise. Scoop out seeds. 3. Lay squash facedown in a rimmed baking dish or pan. 4. Add water until it’s halfway up the sides of the squash. 5. Bake for 1 hour. Remove from oven without turning off the heat. 2. Add onion and cook for 2 minutes, or until onions are soft but not brown. 3. Add apricots, paprika, cinnamon, and salt. Cook for 1 to 2 minutes. 4. Add pumpkin seeds , and stir to combine. Cook for another 2 minutes. 1. Scoop half of the filling into one of the squash halves. 2. Repeat with the other half of the squash. 3. Bake filling side up for 10 minutes. While organizing an office party, ask for advice and input from other people in your office. The decorations should match the occasion. Gather around and brainstorm corporate holiday party ideas until you can arrive at one that everyone agrees on.